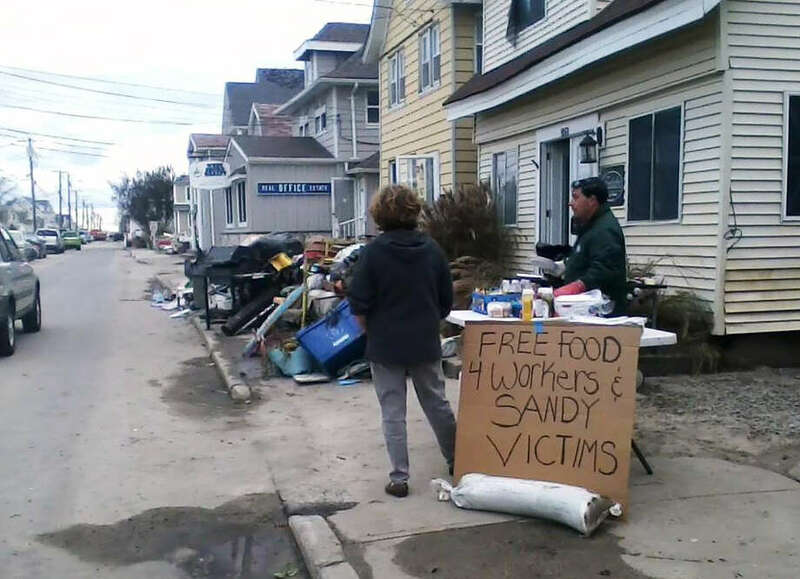 Carl Loschiavo, owner of the house shown behind him on East Broadway in Milford, took to a grill on Friday and Saturday after the passing of Hurricane Sandy to cook hot dogs and hamburgers for residents and emergency workers. The Milford shore area took substantial pounding from the storm. Homes along East Broadway were savaged, salt water from Long Island Sound mixing with backed up sewage, storm flotsam and jetsam, to form an awful mixture in basements, crawlspaces and first floors. When Carl Loschiavo, a 37-year-old Stratford man who owns and rents a house at 850 East Broadway, arrived he found devastation. His tenants had been evacuated, but many of their belongings had been destroyed, and the structure itself was badly damaged. So Loschiavo set to work, alongside all the others. But he wanted to contribute something to the overall mood. He set up a grill, a table and all the fixings, and cooked hot dogs and hamburgers for two days at the end of the week for neighbors, workers and anyone else who needed a break and a bite from the back-breaking work.